Below are videos and photos of random happenings throughout the past two months as we play catch-up again on the events and happenings of our family. 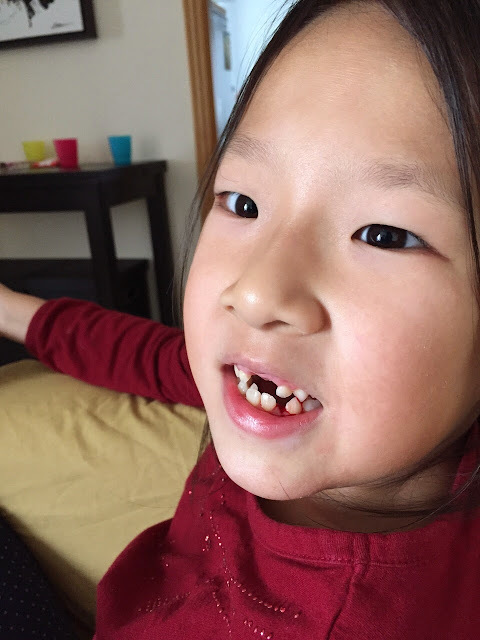 Natalie continues to lose teeth (and giant adult teeth are coming in, too), she also loves to read and send me texts via her iPad, and she's developed double eyelids! She's also busy planning her 8th birthday party this year with her bestie Olivia. Lauren has started piano lessons and her teacher (Sylvia) says she has great concentration. She always does a great job with her school homework, and has become very helpful at home by enthusiastically and proactively helping whenever and wherever she can. Ashley continues to love her blue blanket, which we have now cut in half to ensure it lasts a bit longer. She also continues to talk and learn so much and so quickly -- she's definitely not my baby any more! Video 746 - Lauren and Ashley love following long to music videos. Watch them dance to "No more monkeys jumping on the bed"
Video 747 - Ashley read a book in Cantonese. She now attends a Cantonese kindergarten and has picked up the language very quickly. We don't understand everything she says, but clearly it's Chinese! Video 748 - Ashley ordering her food at IFC -- she has developed a sense of what she likes / dislikes. Video 749 - Ashley declaring her own cuteness.